USATT and ITTF rules require that a paddle have red on one side and black on the other. 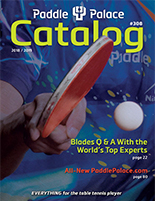 Paddle Palace paint sheets are meant for the penhold player (or any player) who uses rubber on just one side of the paddle. The paint sheet comes in a square with adhesive on the back side for easy assembly. Peel the paper off, stick it to your blade, then trim around the edge.